The Sunshine State is widely known for its outlet malls and unique beach boutiques -- but there's another side to Florida's shopping scene. Flea markets. Not even 100 mega malls or 1,000 garage sales could display the varied inventory you'll discover at Florida's flea markets. Hawked by itinerant dealers, working farmers, part-time collectors, and professional merchants from across the Southeast (and, in the winter, from across America), a curious collection of super-affordable merchandise fills indoor booths and outdoor fields. To discover the mother lode of merchandise, just unfold your road map, grab your wallet, and prepare for some fantastic retail road trips. Where's Waldo? 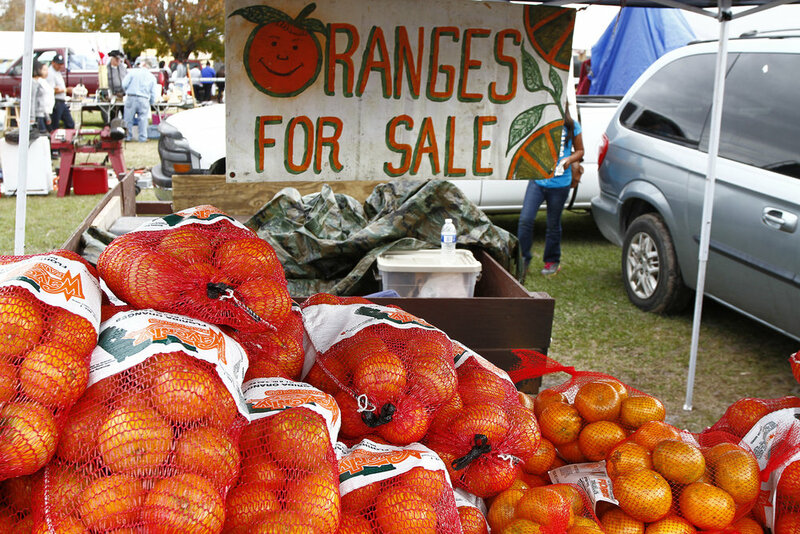 It's about 15 minutes northeast of Gainesville and it's where more than 900 dealers set up shop at “The Old-Fashioned Flea Market” each weekend. As a result, more than 40,000 shoppers flood into this small town, combing through six large buildings as they search for leather goods, DVDs, tools, clothing, kitchen gadgets, appliances, linens, produce -- and really anything else they think they need. If you're more inclined toward antiques, head next door to the Waldo Antiques Village. Open seven days a week, the village showcases 20,000 square feet of antique furniture, collectibles and knick-knacks. How does a one-day-a-week market manage? Quite well, actually. In the small town of Webster, an influx of visiting shoppers swells the local population from 800 to more than 50,000 every Monday. Established in 1937, this is actually two markets in one. The first is a massive flea and farmers market with 2,000 spaces and 1,500 dealers specializing in standard flea fare and farm fresh produce. Across the street, Webster WestSide showcases the goods of approximately 500 antiques and collectible dealers. This is where you can find anything from a Lone Ranger lunchbox to original 1920s silent movie advertising slides, as well as Coke collectibles, pottery, militaria, 1940s kitchenware, patio furniture, African masks… and many other things your mom probably threw away. Midway between Daytona and Jacksonville, the St. Augustine Flea Market features 300 permanent dealers (and up to 100 drop-in dealers) who peddle rare books, records, and rustic hardware alongside Indian collectibles, beads, fishing poles, citrus, instruments, sporting goods, computers, and Art Deco furniture. You'll also find Cajun-boiled peanuts, pets, clothing, tools and anything that has room for a price tag. Tired? This is the rare market that includes an RV park. Hungry? In addition to restaurants, this market features a U-pick farm. Many Central Floridians have added this clean and well-stocked flea market to their weekly shopping schedule. Close to popular retirement community of The Villages, the MoM in Belleview features approximately 400 dealers at more than 1,100 booths filled with impressive (and affordable) inventory. Drop by any Friday, Saturday or Sunday ad you can stock up on tools, T-shirts, fashion, cell phones, office and home furnishings, artwork, produce, books and more. Be sure to check their calendar for special weekend swap and/or shop events that focus on a variety of subjects including military vehicles, guns, stamps, antique engines and – believe it or not – gourds. There's plentiful parking beside the covered pavilions so weather will never interfere with a good day of shopping. Claiming the mantle "America's Largest Flea Market," Sanford's Flea World is a legend among enthusiasts of flea markets in Florida. This Sanford flea market broke ground with services such as hair stylists, tax preparers, psychics and wedding reception rentals. With 1,700 booths, vendors deal in that unusual region between Florida flea market and bargain store with about eight "dollar stores," selling everyday wares like bungee cords, tools, and cell phone covers. Flea World also has a pet store, plenty of electronics, and a "Garage Sale Row." Want to bring the kids? Flea World's "Fun World" features go-karts, bumper cars, miniature golf and other kid-friendly activities. Located at the junction of Highway 92 and Interstate 4, this Friday-Sunday market should be on the list of every sun worshipper and NASCAR fan. Not only will you find deals on sunglasses and beachwear, the market's "Speedway" area features souvenirs honoring the legends and heritage of nearby Daytona International Speedway. More than 800 vendors spread across the market's 30 acres pitching produce, pickles, antiques and collectibles, tires, spices and rubs, New Age gifts, custom jewelry, Avon products, darts, vacuums, knives, landscape plants and garden supplies. After getting a trim at the barbershop, dine in air-conditioned comfort – then get a tattoo (that's here, too). Check their calendar – the market hosts monthly car cruise-ins and craft shows. Busy on the weekend? No matter. This multicultural market, located northwest of Miami, is open seven days a week from 6 a.m. to 6 p.m. The highlight may be the 200,000-square-foot farmers market that features a cornucopia of freshly harvested items from fields and groves in nearby Homestead. To accommodate a steady stream of shoppers (about 100,000 each week), a 10,000-space parking lot gives customers easy access to eight restaurants and merchandise that includes appliances, pets, ceramics, shoes, handbags, luggage, sportswear, watches, auto accessories, toys, wigs, a barbershop -- and a dentist! Sure, you can find plenty of new flea market merchandise inside B&A, but as you stroll past the outdoor vendors you may detect a feeling similar to one you'd experience in a Middle East bazaar. Rugs and fortunetellers are among the standouts at the largest and oldest Florida flea market on the Treasure Coast. The market's 500-plus dealers are also keen to strike a bargain on golf equipment, produce, ladies' fashions, antiques, estate jewelry, furniture and tools. When in Stuart, you can also save some gas: Instead of combing the town in search of far-flung garage sales, "Garage Sale Alley" offers novice dealers a centralized place to clear out their clutter (and gives shoppers a shot at more bargains). Among Fleamasters' 900 stores, 20 food stands, and 400,000 square feet, merchandise highlights include sunglasses, prescription eyewear, boots, motorcycle gear, flags, board games, sun dresses, locally-produced wines and children's apparel. You can even change your appearance by shopping for a wig at – dig this – the WigWam. So after you're decked out in your new glasses and bouffant hairpiece, head over to the 300-seat Music Hall to take in free live performances by local and touring bands. On a prime location the length of a football field off I-75, this Friday-Sunday market midway between Naples and Fort Myers in Bonita Springs has a soothing tropical veneer, which makes perusing the wares of its 220 dealers a treat. The merchandise is similar to that of other markets (beads, books, cell phones and accessories, hardware, jewelry, leather apparel, cleaning supplies, crafts, plants, watches and more), but each weekend the atmosphere gets a boost. Saturdays offer Karaoke at Bahama Momma's Tiki Bar, Sundays from October to May feature bluegrass jam sessions and open mic performances, and Dixieland bands play every Friday from December through March. The reason Renninger’s is one of the best flea markets in Florida is that it has the best of everything. On its 130 acres there’s a great flea market at the top of the hill, and its twin is an equally appealing antiques market at the bottom of the hill. The flea market has a fantastic assortment of plants, produce, cards, music, furnishings, books, art, food, and even a tattoo parlor. Arrive here early on a Saturday morning and you may find yourself shopping alongside dealers from the neighboring antiques market looking to replenish their stock. By the time you’ve scoured the flea market, you’ll go down the hill to discover surprisingly fine furniture, art glass, Arts and Crafts lighting fixtures, 1939 World’s Fair collectibles, Art Deco designs, and anything and everything else you’d find in the finest shops anywhere. Their success in Mount Dora prompted Renninger’s to take on an existing market on the Space Coast, and ‘super’ is a great way to describe it. Open Friday-Sunday, Super Flea includes nearly two and a half miles of covered shopping, food courts, a beer garden, and special monthly attractions. What will you find in the market’s 800 booths? Pretty much everything including fresh produce, spices, arts and crafts, plants, appliances, electronics, furniture, cell phones and, best of all, Florida souvenirs. Once you've been bitten by the fleas, you may just scratch malls off your shopping list. Accent pieces for your home and new additions for collections can be found at a fraction of the cost and with more fun than shopping a decorator's gallery. If you're a flea novice, keep these tips in mind for a successful shopping excursion. If you find an item which is too large for you to haul home (i.e., a dining room set), ask at the market office if they have a dealer who makes deliveries. Beware of "repros" – reproduction items copied so exactly sometimes experts can't even tell them apart from the real thing. When in doubt, doubt. If you arrive and see something you can't live without, ask the dealer to hold it for an hour. You may run across the same item elsewhere in the market for a lesser price. Recently, I was tempted by a $75 Art Deco clock – then found a dealer that had an identical clock for just $25. Feel free to haggle. It's expected. First, ask what the very best price is and then make your offer. The tone in a dealer's voice will tell you when they're firm on the price so don't push your luck. On the other hand, if you can bear to walk away from a bargain, you may find them calling you back to give you a better price. It's a good idea to carry a sturdy plastic bag for purchases and keep an umbrella handy in the event of rain. Two smaller items to bring along are a magnet to check if a brass item is authentic. If it really is brass, the magnet won't stick. Also, carry a magnifying glass to check for small trademarks and jewelry markings. Carry an assortment of bills and coins. Dealers can't always make change. Sometimes, you can even get a $5 item for less if you show you're only carrying four singles. If you arrive in town on a day when there's no flea market, buy a local paper and map out garage sales and auctions.